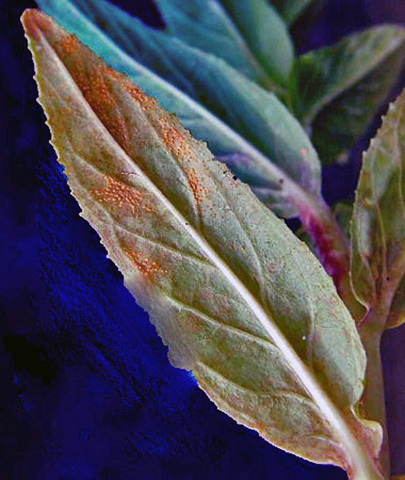 Fuchsia rust is caused by a fungus, and appears as pale patches on the upper surface of leaves, with corresponding spore filled orange pustules, on the underside. The windborn spores may overwinter on Willowherb plants and some forms of fir. Indoor fuchsia may may affected the year round,whereas,outdoor specimens are generally affected in late summer / early autumn. The lower leaves are usually worst affected, these shrivel leaving a straggly lack lustre looking plant. Remove infected leaves when noticed and destroy any badly affected plants. Fuchsia are sensitive to the fungicides used to control rusts and should not be sprayed.